Skybound Watch Pass is a small Nordic tower and ruin north of Helgen. The location is occupied by bandits. Although the interior is named Skybound Watch Pass, the map markers are named North Skybound Watch and South Skybound Watch, and therefore finding both entrances to the pass counts as two separate locations for the "Locations Discovered" statistic. South Skybound Watch is displayed on the map as a Nordic Tower whereas the northern entrance is displayed as a Ruin (map). The entrances are within Falkreath Hold near to the border with Whiterun Hold. The northern entrance is to the southeast of Riverwood while the southern entrance is directly south. 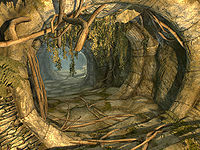 However, it is only a quest destination for Falkreath Hold quests. Three bandits reside in the remains of the guardhouse. As you enter through the arch to their sleeping area there is a half buried burial urn on your left, with a random war axe lying on a broken sideboard. Opposite the arch you enter through is an iron door, with a rabbit hanging from a rack and a pheasant on the ground beneath it. To the right of the door is a table and two chairs holding a rabbit haunch and a medium coin purse. Next to the table is a small cage and beside this is a random warhammer, and a bench with a copy of Yellow Book of Riddles on top. An empty pot hangs above the campfire in the middle of the room, with two unowned bed rolls beside it. Through the door is a lookout point with a pedestal at the end, used for the Destruction Ritual Spell quest and to the left is a novice-locked chest. Follow the stairs down on the right to find the door leading to the interior section of the pass. The path that leads up to it from near Orphan Rock is guarded by a wispmother and three wisps. The tower has a novice-locked chest with random loot at the very top, a random helmet on top of a broken stone table on the level below and a random potion of healing, magicka or stamina on a shelf to the immediate right of the iron door leading into the interior of the pass. The passage helps link the lower lying region of Whiterun to the mountainous portion of Falkreath and is divided into three small sections. On either end of the passage are a number of bandits that are cut off by a giant frostbite spider's lair. Entering from the south leads down a flight of stairs to a room containing many jazbay grapes and hanging moss, with a stairwell in the middle. Wooden spiral stairs lead down to a passage, where three bandits wait. There is an urn on your right and a bit further a burial urn on your left. This portion of passage is slightly flooded and contains a large amount of hanging moss. There is an unlocked chest against the east wall, which is trapped with an apprentice-level tension cable that triggers poison darts to shoot from the wall. To avoid damage, either disarm before opening, or just stand to the side until they stop. The passage leads to a door, with a giant frostbite spider on the other side of the door facing towards you. Entering from the northern entrance you will immediately see a couple of bed rolls and then eight hanging moss growing from the ceiling. If sneaking you will see the first of two bandits sitting at the top of a flight of stairs part way down, with the other just to the right out of sight. Beyond the bandits is a pressure plate that triggers a battering ram. At the bottom of the stairs is a campfire in front of a set of shelves holding various fur armor, a pair of random light boots, two small coin purses, and a copy of the Block skill book Battle of Red Mountain. On a sideboard there is a novice-locked chest and a random potion of healing, with a piece of fur armor on the floor next to it. Through the door and you will see webbing and spider egg sacs, one of which is harvestable. Follow the stairs down past another harvestable egg sec and several dessicated corpses and web secs that can be looted. At the bottom you will encounter the same giant frostbite spider. In the ruins are 23 samples of Hanging Moss and 8 samples of Jazbay Grapes. A moonstone ore vein is located 240 ft east-southeast of the North Skybound Watch entrance, roughly halfway to Orphan Rock, on the east side of the valley. This page was last modified on 7 January 2019, at 05:15.